As gun policy discussions unfold in the wake of mass shooter incidents, they routinely end in three buckets. There’s the “tyranny can never happen here” bucket, which the left has mostly abdicated in the wake of Trump winning after they called (and still call) him a tyrant. There’s the “you can’t fight the army with small arms” bucket, which is increasingly unsound given our ongoing decade-and-a-half war with Afghani tribal goat herders. And there’s the “what the hell do you need an AR-15 for anyway?” bucket, which, by its very language, eschews a fundamental lack of understanding of what those people are thinking. I am not a prepper. But I know a few. Some of the ones I do know are smart. They may not be doing as deep an analysis as I present here, on a mathematical level, but the smart ones are definitely doing it at a subconscious level. If you want to understand the perspectives of others, as everyone in my opinion should strive to do, then you would do well to read to the end of this article. To get where we’re going, we will need to discuss the general framework of disaster mathematics. I’m not a writer by trade. I’m a stormwater hydrologist, and in my opinion, a pretty good one. Hydrology is the science of tracking water as it moves through the water cycle, from ocean evaporation through cloud formation, precipitation, groundwater infiltration, runoff, evapotranspiration, riverine hydraulics, and the time series behavior of reservoirs. It is a deep and fascinating field, but one of its most relevant applications to our lives is delineating floodplain boundaries. To determine a floodplain boundary, we first identify a “storm event” that concerns us. We use historical rainfall data and some statistical magic to calculate the worst storm event a place is likely to experience in a 100-year time span, probabilistically speaking, and we call that the “100-year storm.” There’s a push in the field to quit calling it that, because it confuses the muggles, so now we often say something like “the storm which has a 1% chance of happening in any given year.” Then we take that rainfall data, judiciously apply more math, and turn it into a flow rate in a river. Then we do hydraulics (more math) to determine how deep the river will have to be to carry that much water, and we draw a line on a map. You should have seen this line, if you’ve ever bought a house near a floodplain. If you bought a house near a floodplain and were not shown this line, contact me professionally to ensure you didn’t make a terrible mistake. Let’s quickly walk through this. The chance of flooding, P(F), is 1%, or 0.01. The chance of not flooding, which we notate P(F’), is 100%-1%, or 99%, or 0.99. 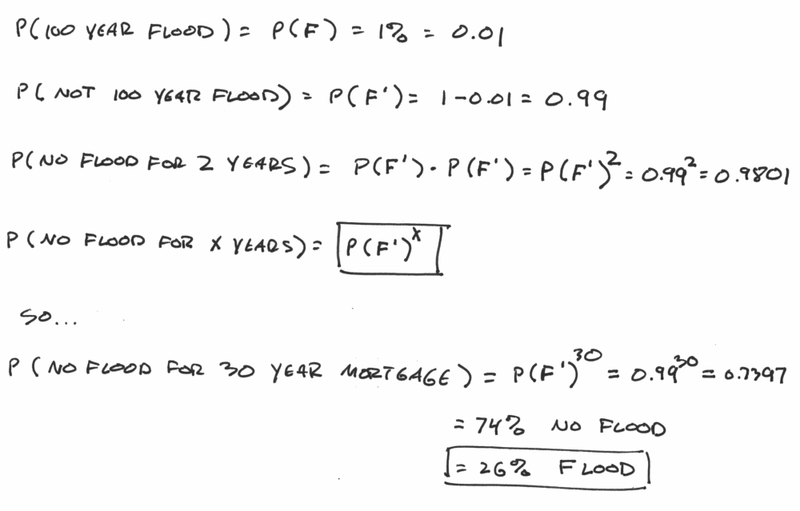 To see the chance you don’t flood two years in a row, you would have to “not-flood” the first year, and then “not-flood” the second year, so you multiply the two probabilities together, and get 0.9801. The chance of “not-flooding” 30 years in a row is calculated by multiplying the chance of not flooding with itself, over and over, 30 times, which is a power relationship. P(F’)³⁰. That’s 0.7397 chance of 30 consecutive years of no flood, which means a 26% chance of at least one flood. And then your mortgage broker doesn’t give you your thirty-year fixed rate loan, because a 26% chance of a disaster is a big chance, when we’re talking about disasters. Now let’s talk about a bigger, nastier disaster than a flood. While we don’t have any good sources of data on how often zombies take over the world, we definitely have good sources of data on when the group of people on the piece of dirt we currently call the USA attempt to overthrow the ruling government. It’s happened twice since colonization. The first one, the American Revolution, succeeded. The second one, the Civil War, failed. But they are both qualifying events. Now we can do math. Stepping through this, the average year for colony establishment is 1678, which is 340 years ago. Two qualifying events in 340 years is a 0.5882% annual chance of nationwide violent revolution against the ruling government. 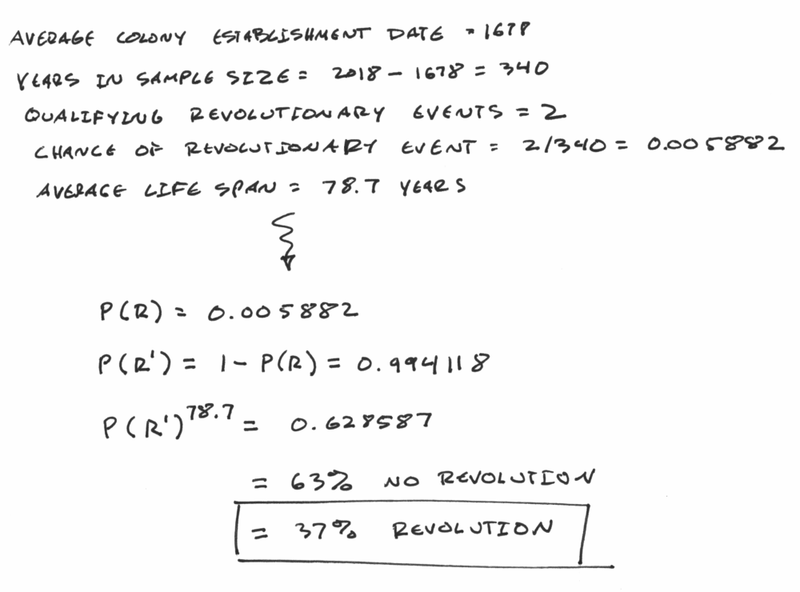 Do the same math as we did above with the floodplains, in precisely the same way, and we see a 37% chance that any American of average life expectancy will experience at least one nationwide violent revolution. This is a bigger chance than your floodplain-bound home flooding during your mortgage. Following the same procedure, we can see that even over an 18-year span we have a 10% chance of violent revolution, which is an interesting thought experiment to entertain before you have kids. It’s also important to note that a violent nation-state transition doesn’t just affect people who live in a floodplain. It affects everyone stuck in the middle. Especially the poor and defenseless. Am I? Two instances in 340 years is not a great data pool to work with, I will grant, but if you take a grab sample of other countries around the world you’ll see this could be much worse. Since our 1678 benchmark, Russia has had a two world wars, a civil war, a revolution, and at least half a dozen uprisings, depending on how you want to count them. Depending on when you start the clock, France had a 30-year war, a seven-year war, a particularly nasty revolution, a counter-revolution, that Napoleon thing, and a couple of world wars tacked on the end. China, North Korea, Vietnam, and basically most of the Pacific Rim has had some flavor of violent revolution in the last 100 years, sometimes more than one. With Africa, it’s hard to even conceive where to start and end the data points. Most Central and South American countries have had significant qualifying events in the time span. And honestly, if we were to widen our analysis to not only include nationwide violent civil wars, but also instances of slavery, internment, and taking of native lands, our own numbers go way up. Or we could look at a modern snapshot. Counting places like the Vatican, we have 195 countries on the planet today. Somalia is basically in perpetual war, Syria is a hot mess with no signs of mitigation any time soon, Iraq is sketchy, Afghanistan has been in some flavor of civil war or occupation my entire life outside the salad days of the Taliban, and Libya is in such deep throes of anarchy that they’ve reinvented the African slave trade. Venezuela. The Israeli-Palestinian conflict may be a qualifying event depending on how you define it. And again, Africa is … hard to even conceive of where to start. Spitballing, perhaps 3% of the nations in the modern world are in some version of violent revolt against the ruling government, some worse than others. There’s at least some case to be made that our 0.5% annual chance estimate may be low, if we’re looking at comps. Or we could look at a broader historical brush. Since the fall of Constantinople in 1453, there have been 465 sovereign nations which no longer exist, and that doesn’t even count colonies, secessionist states, or annexed countries. Even if we presume that half of these nation-state transitions were peaceful, which is probably a vast over-estimation, that’s still an average of one violent state transition every 2.43 years. If we look at raw dialectic alone, we reach dismal conclusions. “Do you think the United States will exist forever and until the end of time?” Clearly any reasonable answer must be “no.” So at that point, we’re not talking “if,” but “when.” If you don’t believe my presumed probability, cook up your own, based on whatever givens and data pool you’d like, and plug it in. The equations are right up there. Steelman my argument in whatever way you like, and the answer will still probably scare you. In 2010, 8.5 million tourists visited Syria, accounting for 14% of their entire GDP. Eight years later, they have almost half a million dead citizens, and ten million more displaced into Europe. They didn’t see this coming, because if they did, they would have fled sooner. Nobody notices the signs of impending doom unless they’re looking carefully. Further, the elites of a nation rarely take it on the chin. They can hop on a plane. The poor, disenfranchised, and defenseless experience the preponderance of the suffering, violence, and death. They’re the ones that should be worried. Pretend you’re someone with your eyes on the horizon. What would you be looking for, exactly? Increasing partisanship. Civil disorder. Coup rhetoric. A widening wealth gap. A further entrenching oligarchy. Dysfunctional governance. The rise of violent extremist ideologies such as Nazism and Communism. Violent street protests. People marching with masks and dressing like the Italian Blackshirts. Attempts at large scale political assassination. Any one of those might not necessarily be the canary in the coal mine, but all of them in aggregate might be alarming to someone with their eyes on the horizon. Someone with disproportionate faith in the state is naturally inclined to disregard these sorts of events as a cognitive bias, while someone with little faith in the state might take these signs to mean they should buy a few more boxes of ammunition. “But if one of these things happens, you’re screwed anyway!” Well, sure. The point of disaster planning for a hurricane, tornado, earthquake, or wildfire, is not to be “not-screwed.” It’s to be notably less screwed. Ready.gov is the central point for information about family disaster preparedness planning here in the US. They list a wide range of things they think you might want to prepare for. Chief among these is flooding, which is my field, but they also list many other things an alarmist might include in their family disaster preparedness plan, from volcanoes and tsunamis to space debris, nukes, and terrorist dirty bombs. Violent nation-state transition doesn’t make the list, though, because the list was compiled by the government. But the best one to prepare for, in my opinion, is zombies. A way to defend items 1–5. In modern terms, that means firearms. Rifles in particular. Optional: Escape method. Sailboats rank highly on any objective list here. For the ethical zombie prepper, firearms are a relatively small piece of this overall disaster plan, but a necessary one. For an unethical zombie prepper, firearms may be all they need, if they can find someone else from whom to steal. The Bosnian War is a great test case for this, and many firsthand experiences have been chronicled since, about how prepper-minded people were the likeliest to survive. And it’s not just tin foil hat equipped right wingers thinking about this stuff. There’s a widely reported trend of Silicon Valley billionaires building apocalypse bunkers, as many as 50% according to Steve Huffman, the guy who founded Reddit. Yishan Wong, another former Reddit CEO, goes through a conceptual ROI analysis with The New Yorker. And it’s not just the techies. A lot of folks in Hollywood are thinking the same thing. It’s big business out there. Gary Lynch, GM at Rising S Bunkers, a Texas-based company that specializes in underground bunkers and services scores of Los Angeles residences, says that sales at the most upscale end of the market — mainly to actors, pro athletes and politicians (who require signed NDAs) — have increased 700 percent this year compared with 2015, and overall sales have risen 150 percent. So that’s another canary in the coal mine for the tin foil hat right winger — you have a class of people who are vehemently demanding confiscation of rifles in the public sphere, while some of them are secretly building underground fortresses in the private sphere. Buy another box of ammo. Clearly. When our semiannual mass shooter culture war erupts after the latest round of media Handwaving Freakoutery, it always seems to focus on rifles. Most recently, we had some guy cut his own AR-15 in half on YouTube, to thunderous applause. Don’t mischaracterize my position. If Mr. Pappalardo thought that he might be prone to murdering someone with his rifle, or more statistically likely — purposely killing himself with it, then he should absolutely sell or destroy it. But if he isn’t going to do either of those things, all he must do to ensure it doesn’t hurt anyone is not shoot anyone with it. He could leave it in his attic with a couple of cans of ammunition, just in case something horrible does transpire where he might actually need it. There are certain things in the world you’d rather have and not need, than need and not have. And paramount among those things, given the state of the modern human condition, is a rifle. Liked it? Take a second to support bj campbell on Patreon!